Call it what you will – a funeral, a farewell, a celebration of life. However you choose to describe it, acknowledging the end of a loved one’s earthly presence should be more than just a “one size fits all” type deal. My mission in the creation of Artisan Funerals, is to guide people in making beautiful, informed and memorable choices based on their own unique needs. My name is Karen Lucas. I have been a trusted funeral care provider since starting as a trainee embalmer/mortician and funeral assistant in 2001. 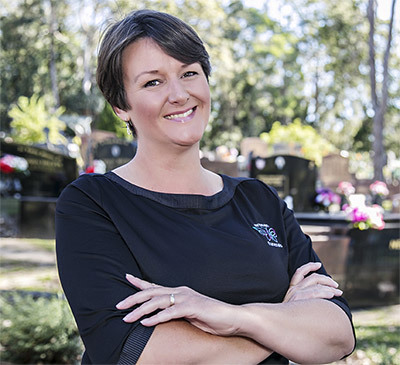 I began my journey at a family owned funeral home on the Coromandel Peninsula, learning all aspects of funeral care, from care and presentation of loved ones, through to arranging and conducting of funeral services. Working within this close-knit community of mostly Pakeha and Maori families gave me a huge appreciation of the diversity of cultural, religious and often budgetary needs which must be met when someone has passed. I was then based for several years in south Auckland, furthering my experience within an even more widely varied cultural community. Now based on the beautiful Gold Coast with my husband and five year old son, I’m bringing some Kiwi “can do” to funeral care here! Dismayed by the increasing corporatisation of the funeral industry where sales targets and profit margins appear to be the priority, I saw a real need in the community for a more personal approach where the priority is the needs of the family, and/or the wishes of the deceased. My passion is to personalise each, and every service. To listen and understand your needs. To humanise the funeral process, and to make every farewell the most positive experience it possibly can be, whether you are wanting ‘’all the bells and whistles” or something more low-key. Whether you are pre-planning for yourself or you are arranging for someone who has just passed away, bring me your thoughts and ideas, your worries and concerns, and together we can create a unique and meaningful farewell. I will be with you every step of the way, right from the very first phone call. I’m a big believer in a cuppa and chat, so give me a call – I can pop around and we can do just that!